PRESIDENT Edgar Lungu has vowed to continue appointing young people and women to decision-making positions in his Government. The President said he was aware that some people were not happy with his decision to appoint young people to Government positions but that he had every confidence that the youth were capable of delivering. Mr Lungu said he had no regrets for appointing youthful Likando Kalaluka, 38, as Attorney General and Chalwe Lombe as Foreign Affairs Permanent Secretary. President Lungu said during the swearing-in ceremony of Mr Kalaluka and Mr Lombe at State House that young people were entitled to serve in Government positions as long as they were Zambians and merited the appointment. The President also appointed Mr Kalaluka as State Counsel while Mr Lombe who was director political affairs at the Ministry of Foreign Affairs replaces George Zulu who has since been appointed as High Commissioner designate to Australia. 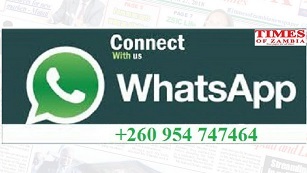 we are wiser and older, is to assist young Zambians settle down and do their best. “Don’t be green with envy. You must instead help the young people settle in their new jobs. Let’s not underrate the young people that’s where the future lies,” he said. He was looking around for more young people and women to be appointed to decision-making positions and asked Vice-President Inonge Wina, who was in attendance, to help him find suitable women for appointment. 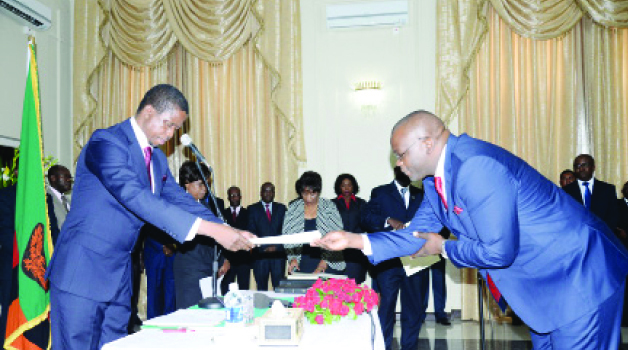 Mr Lungu urged the newly appointed Attorney General to prove his critics wrong by working to the best of his ability. The President said as a member of the legal fraternity himself, he was confident that Mr Kalaluka was well qualified to do the job diligently. He dispelled speculation that he had appointed Mr Kalaluka as a reward for representing him during the intra-party squabbles in the ruling Patriotic Front (PF) prior to the January 20 Presidential Election. “Your appointment is on merit. As a member of the legal fraternity I know him as a professional, not that he has represented me anywhere. “Not even at the height of PF squabbles. I am sure he will be equal to the task,” President Lungu added. Mr Kalaluka’s burden would be made lighter through consultation from previous Attorney Generals, State Counsels and other fellow lawyers. Mr Lungu also reminded Mr Lombe that he was being elevated to the position of Permanent Secretary at a time Zambia was reviewing its diaspora policy to ensure Zambians living abroad could participate in national development. The new Attorney General thanked Mr Lungu for appointing him and urged the citizens to rest assured that he would dispense justice fairly.